Friday Protest at Prime Minister Official Residence Losing Steam? Or Just the Summer Doldrums? Not surprising, given the summer vacation and coming "obon". More and more people have started to openly say how immature some of the organizers of the Friday protests are in attacking anyone who doesn't agree with them with vicious words. 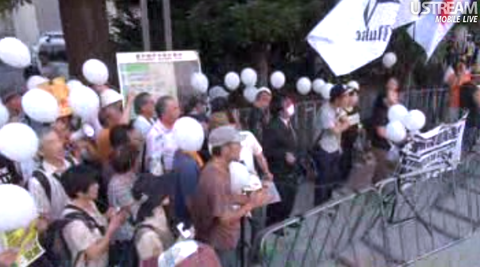 Some also say women from Fukushima Prefecture had been protesting in the Kantei (PM's Official Residence) area long before they showed up. Attribution errors on the part of the organizers (i.e. they are the ones who have made it happen) may cost dearly. Photographs that I found on Twitter seem to show there was a plenty of space and a plenty of policemen but not enough protesters to fill the space and keep the police busy. There is no mention of how many people participated, either from the semi-official police source or from the organizers. No one is even guessing (or not that I could find). The woman in the last photo with tattoos on both arms is one of the organizers. Well, we've tried attending meetings, writing letters, publishing articles and books, signing petitions (meeting all the requirements to cause a vote that was refused, attended demonstration after demonstration. But whatever you do, don't give up. We must stop this madness for our children's sake.